The first time I noticed Leo’s Taco truck at La Brea and Venice Blvd I was returning from El Chato having just consumed a plateful of tacos. The crowds of people standing around the truck signaled a certain quality. Your average day time taco truck can get a crowd out of sheer probability (park in front of an office at lunch time), but a taco truck that has a crowd at 9pm at night is one to keep an eye on. You order your tacos from a gentleman that stands behind a podium with a cash box. He is sort of a taco conductor gesturing with both the taquero that is manning the al pastor spit and the cooks inside the truck that prepare all the other orders. 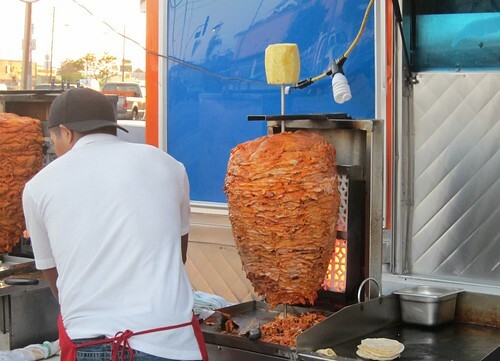 The conductor writes a ticket for each order and attaches the tickets for Al Pastor next to the cart with the Al Pastor and hands all other tickets to the cooks inside the truck, The tickets for the taquero read 2p, 3p, 4p, the p of course standing for al pastor. I thought it was an ingenious system devised by the conductor, I only questioned the adding of the p to the tickets for the taquero. Afterall, the taquero manning the al pastor spit knows that the numbers on the tickets are all that matters to him and he knows that he is only responsible for al pastor. The adding of the “p” is irrelevant to him. I guess these are the things you think of when waiting for your tacos. This is the first time since I started on the taco beat where I have seen Al Pastor carved directly from the spit on to the tortilla. 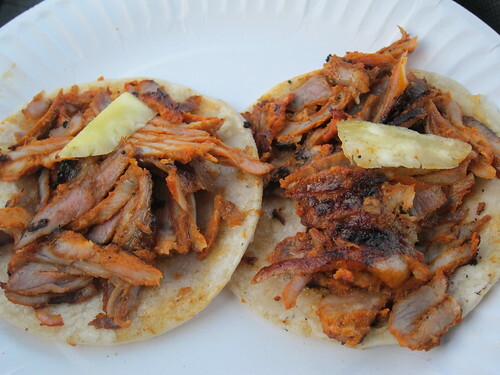 Most real Al Pastor in LA is cut from the spit then grilled on a plancha. Sometimes it is mixed with onions while on the grill. Some of the best al pastor I’ve had has had a charred taste to it. But this Al Pastor was entirely different. This is by far the most tender al pastor I have ever had. 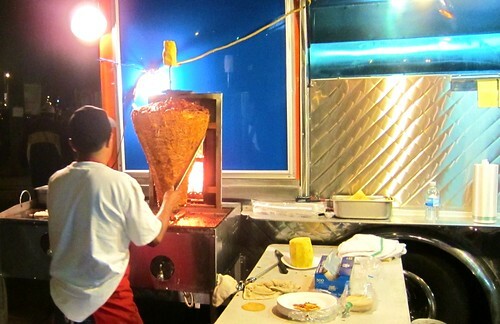 And this taquero was one of the few skilled taqueros I have seen around LA. His carving of the pork is one thing but the way he cut the pineapple, well he just made it look easy. And I gather it is not. With one hand the taquero holds the tortillas in his hand, and with the other he carves pork from the spit right on to the tortillas. 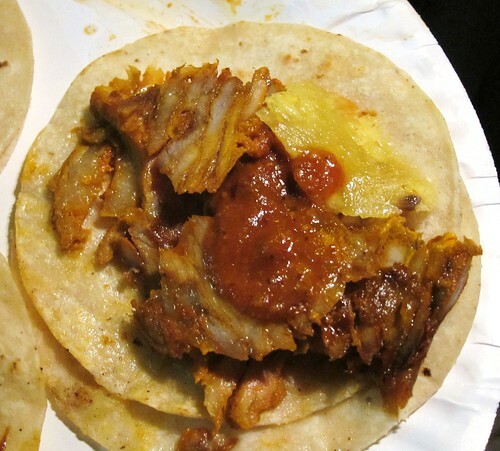 When he has carved enough meat on the tortillas he takes his knife and cuts off a slice of pineapple from the top of the trompo on to the taco which he holds in his hand. He then gestures to the conductor who compares the ticket with the plate. A ticket that says 3p is matched with a plate of 3 tacos. The conductor then gets rid of the 3p ticket. Standing there I began to think that perhaps the “p” is for the conductor and not the taquero. 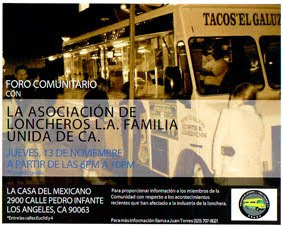 Perhaps the conductor writes 3a or 3c on the tickets for the cooks in the trucks for asada and carnitas and at the end of the night he counts his tickets to see what he sold. Once you receive your tacos there is a table of condiments and salsas to garnish them with. There is a salsa verde, salsa roja,avocado salsa, as well as onions, cilantro, radishes, cucumbers, and limes. You get all this for $1 a taco. Update: I've been hitting up this truck pretty frequently and it's been better each time. They now have two al pastor spits because of the demand. 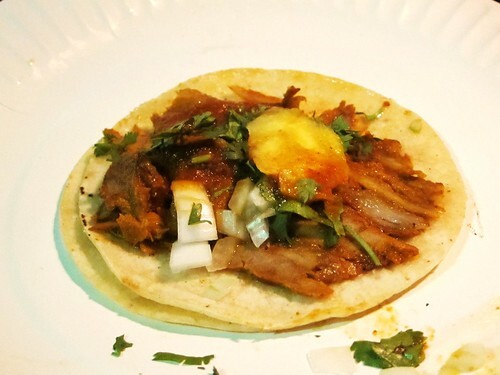 The pork is so good you don't even have to dress the tacos with onions, cilantro or salsa. I drizzle a little salsa roja on the tacos sometimes but by itself it's amazing as well. My previous score of 4.5/5 is being amended to 5/5. 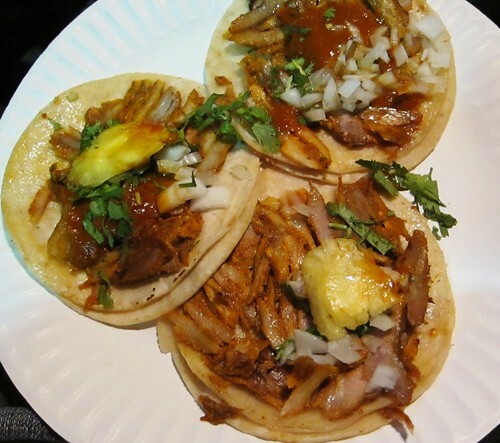 Update II: The city has shut down Leo's outdoor Al Pastor spit. Squid Ink has the details. Typical anti-taco behavior from the city. Update III 10/1 The trompo rides again! The al pastor spit is back at Leo's. There's a different taquero who's also very talented with the flick of the pineapple and the carving of the spit. I didn't notice much a difference in the taste. Still excellent and by far the best LA has seen. holy shi.. the skills to slice perfect snippets of pina straight into a pipin' hot tortilla.. just like Mexico? They're like pina samurais. Thank you sir. Can I buy you a beer for this? Another great find, Bandini! I'm going to do a El Chato & Leo's Taco Run!!! This place and its busy crowd caught my eye too when we were coming home from the Chato the other day. I will be looking forward to a visit. 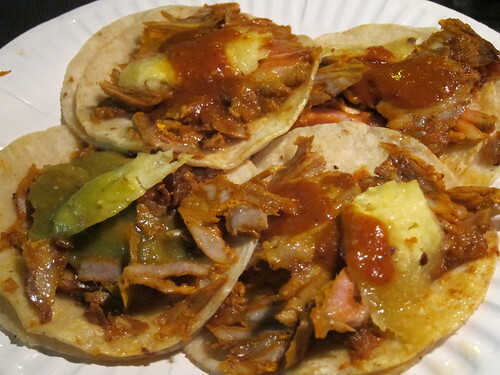 Here's a tip - I heard from a taco friend that the truck by the laundromat at Pico and Fairfax has good nighttime tacos with the al pastor on a spit. did someone say beer? mmm beer. Norm, this one fell right into my lap. They have a pretty good location. One just has to resist the el chato temptation to try them out. 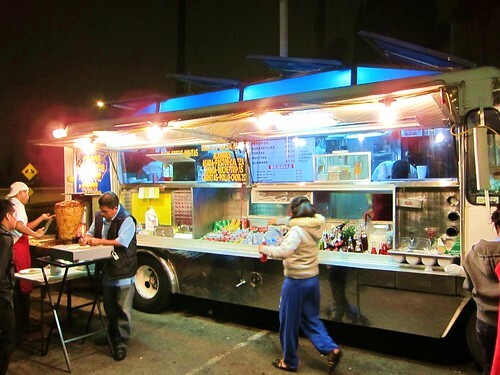 JB, the truck at pico and fairfax at night was Danny's Tacos but he moved back to Olympic and Grand. I've only had taco straight from the spit in Mexico City.I'm excited to try this place next time I'm on the westside. Bandini - the spit is DEAD - Leo's got busted, I suspect as a direct result of the recent publicity, and they now cook their al pastor in the truck on a grill... long live the spit. IS IT REALLY BACK? I will investigate tonight (9/21/2010). the city has shut it down though some have said they are still slicing from the trompo inside the truck. has anyone been back within the last week? I went to Leo's tonight (10/4). No trompo. The man said it was there Friday-Sunday. I'll be back this weekend. Trompo was up Thurs. night. But meat was nothing like those pics. It was gritty and too charred. WAH. I so wanted to love it. Tried Leo's truck tonight -- Sat Aug 4 about 7:30. Short line to order -- several waiting to be served. I had three al pastor tacos. Good, but nothing like the ones you picture. The meat was that ruddy brickred as if spiced marinated and griddled. One of the guys outside said yes when I asked if there was a rotisserie spit, but I saw no evidence of one. Maybe I was too early. Nosh, you were probably there too early. My buddies were there the other night after the Jack White show and the trompo was a turning like always. 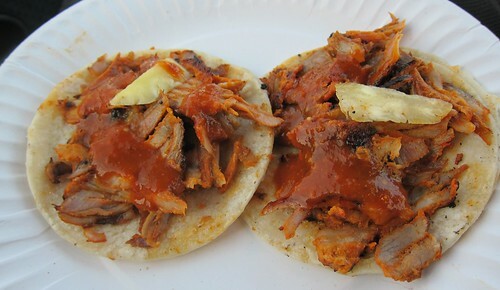 Next time, instead of hitting Carnitas Michoacan before the Dodger game, stop by Tacos Leo after. They now have a second truck strictly for your Al Pastor needs. Holy molly...2 trucks?!! That's when you know they're DOING IT RIGHT. (Poor El Gallito must sob every weekend, lol). 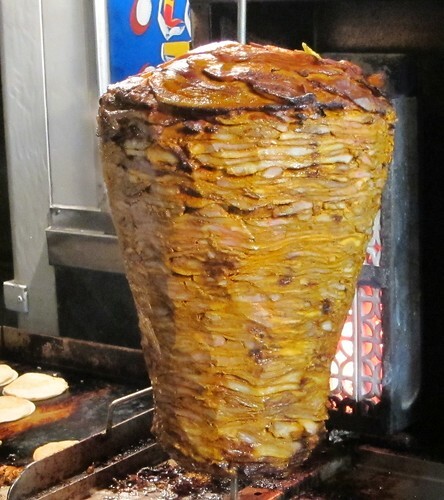 Their Al Pastor Show begins after 6pm, before that they're iffy because they're on a griddle, but once the Spits (yes, SPITS..they have TWO Spinning simultaneously) arrive It's ON like Donkey Kong! Leo's, it's a love hate relationship. I LOVE you so much that I HATE that I can't stay away. Gotta go. Off to a Leo's Run!